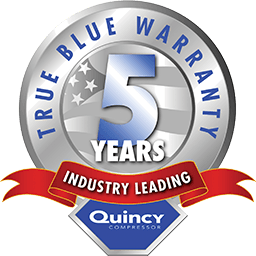 If you’re looking for a highly efficient 5-100 hp compressor, the Quincy QGS can meet your needs. Featuring the most advanced rotary screw air compressor technology, the QGS serves as a reliable source of compressed air for a wide range of industrial applications. And with the low cost of QGS ownership, this peak-performing screw compressor will have a positive impact on your company’s bottom line. The QGS is available with a 5-30 hp belt drive that comes with an assortment of standard premium features. These include a robust TEFC motor, a high-efficiency inlet filter and an air-cooled aftercooler. The low oil carryover protects your tools and equipment from damage. Other features include upward package air discharge, WyeDelta Starting and vibration isolation to ensure quiet operation. The QGS comes filled with eight thousand hours’ worth of QuinSyn-Plus® lubricant to ensure all essential parts and components remain properly lubricated. You also get the benefit of a five-year warranty for the motor, cooler, airend and separator tank.